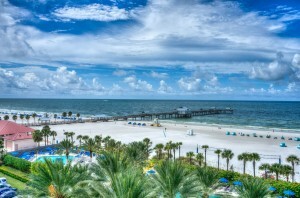 When thinking of Central Florida today, it is a synonym for Disney World, Sea World and Universal Studios and the whit beaches of St. Petersburg and Clearwater, often viewed as one of America's Top Beaches. From a diver’s perspective there are some interesting divespots in this region, especially when it comes to caving/sinkholes and diving with Manatees. The north-central region is filled with natural springs, sinkholes and caves. The Tampa bay area doesn’t have any coral reefs, but there are several artificial reefs. Venice Beach, is known for its shark teeth and Crystal River for being the only place in the US where you can dive (actually snorkel) with Manatees. With such a long coastline, there are of course many other dive spots, like the Fort Myers region. However, the diving is less easy (choppy seas, current, longer distances to the reefs), so it is not covered yet by TheDivingGuide.com. Apart from the amusements parks in Orlando, the central and north west area of Florida has various State Parks. Honeymoon Island State Park, near Dunedin, is Florida’s most visited state park. The shallow waters and many mangrove islands make the area popular with kayakers.